Learn about the ancient art of Japanese calligraphy. Your child can use this activity to learn about another culture or get closer to his own, and practise perfect penmanship while he’s at it! 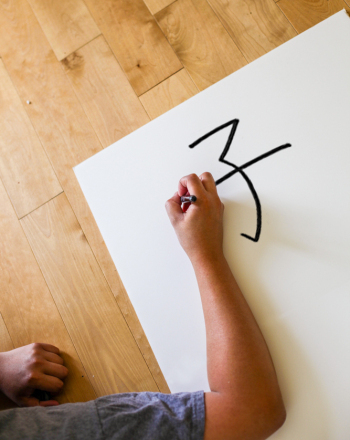 Explain to your child that “kakizome” means “first writing” in Japanese. A New Year’s tradition in Japan, many citizens write calligraphy in celebration of the new year. The practise is supposed to bring good luck for the coming year! Have your child practise his own kakizome. Have him measure and cut a strip from white poster paper to be a long, vertical, rectangular shape, around 12 inches wide by 28 inches long. Have your child look at a website of Japanese kakizome examples. These may give him ideas of calligraphy shapes and phrases to write. Let him know also that some traditional words written for Kakizome include those for good fortune such as “spring” or “happiness.” Let him practise writing it with pencil on scrap paper before writing it in pencil on his poster board. After he has written calligraphy in pencil on his poster, he can go over the pencil lines with either black paint or black permanent marker. In traditional Kakizome, ink was rubbed with the first water taken from a well on New Year’s Day—marker ink is fine for modern times! He can give his calligraphy as a gift to a friend, wishing them happiness, or hang it in his room as a reminder for the New Year to come! Your child can make her own storybook with this series of Japanese folktale coloring pages! Introduce your child to Momotaro, a popular Japanese folktale! Your child will get to make her own story book by coloring the illustrations. This coloring page featuring the mythical creature of Japanese culture, the Baku, shows him waiting anxiously to eat up your bad dreams! Did you know that Japanese Bobtail cats have a short little tail that looks a lot like a rabbit's? Give this unique cat a bit of colour to purrrfect the picture. This tengu coloring page will teach your child about the legendary Japanese creature. Use this tengu coloring page to talk to your kid about Japanese folklore. This Kitsune coloring page features the mythical fox-like creature, present in Japanese folklore. Kids will read a classic Japanese folktale and then answer questions about the the problem, solution, and ending in this fun reading comprehension activity. This kitsune coloring page shows your kid the legendary fox-like creature from Japanese folklore. Use our kitsune coloring page when learning about folk tales. The tallest mountain in Japan stands at 12,389 ft. and is featured on this geography coloring page along with the iconic kimono and cherry blossoms.